I liked Assassin’s Creed (so you know my potential bias). 1. Water — I have seen a lot of complaints about water in the game. The main character cannot swim and will drown if you fall into water. There is one main area where you are forced to deal with water in the last quarter of the game. Other than that there is only very limited access to any water areas. You are in the desert, after all. These complaints are almost entirely directed to the single mission area on the docks, which comprises a tiny portion of the game, and only accessible after having played a vast majority of the game. That, or a single stream in one of the early cities, the length of a couple blocks. I have fallen and drowned in both of these places, but only a couple of times apiece and usually because I was collecting flags and exploring, rather than traveling somewhere specific. Another small tidbit: I remember reading the developers had swiming in the game, but that it made it too easy to escape guards. 2. Blend — Blending has been accused of being both overpowered and boring. Both of these accusations are true. But the need to actually use it is minimal. You never need to slowly sneak by a situation. A common complaint is that it is required during the horseback sequences, but this simply isn’t the case. The blinking red cursor (suspicious guards) will not alarm if you leave their line of sight quickly, which is easy to do on horse back. You do not want to gallop (RightTrigger + A), but a normal brisk pace is almost as fast (just RightTrigger). This goes for the guards in town as well. Even late in the game, you only need to blend to avoid notice of the Guard Patrols (a captain followed by 4 guards in formation). They will not alarm immediately, nor at all unless you get close to them or do something to draw their attention in that direction (have a pot drop, push someone, etc). Every other guard in the city can be sprinted past. These Guard Patrols do not require blend either; I found myself running up the nearest building and circling around that particular alleyway or market long before the captain would have seen me. It was faster to use the free running that it was to blend past them. Blend’s faults are revealed as the crowds disappear. While its execution is perfect when you stealth assassinate and walk away amongst dozens of NPCs, the illusion is broken when you stab a guard and his partner does not notice you, despite you being the only person around (either in the particular alley, or for hundreds of yards in a prairie). It works too well here, and will hopefully be remedied in the sequel. This is, however, entirely preferable to the common stealth game mechanic of Super-Guards. Hitman is especially grievous of this. While the Hitman series is one I’ve always enjoyed, Guards and Civilians somehow know you are the cause of death despite having no evidence, or take lethal action against you for small infringements. Do not try to get the autograph of a French actor. If you approach the rear stage door, the security officer will get up from his chair and immediately fill you with lead with no warning. 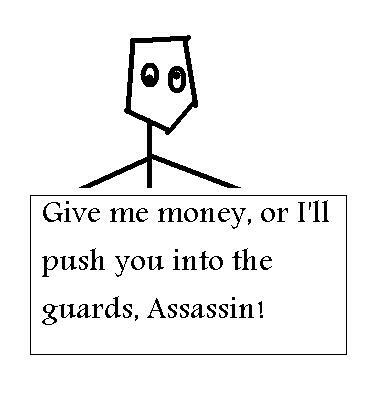 While these games are fun, I liked Assassin’s approach of being able to walk by a guard and not have him immediately shoot/stab me because he knew I was the main character of the game. It made the city seem much more immersive. 3. Beggars — After you play Assassin’s Creed, you will have no sympathy for beggars, drunks, and the mentally ill. You may even want to punch them as you walk to work. If I were a poor, sick, old women I do not think I’d have the courage to ask a man with 8 different types of bladed weapons for money. I certainly would not throw rocks at him if he turned his back to me and began to run away, revealing a dozen more throwing knives on his back. If I were a drunk, I do not think I’d pick a fight with this same man, either. And every mental patient is apparently has a deep hatred for Assassins, and a keen sense as they only push you, and can detect you (if they are facing your direction) in the crowd faster than any guard patrol. 1. Guards — They would run instead of fighting. After you slaughtered enough, the guards would realize “hey, I can’t win this!” and would panic and run. Sometimes to get help, sometimes because they were afraid. You could follow them. They did not just disappear off the map, but would attract attention of other guard patrols. This is great when compared to other games, where you always wondered what the last 2 or 3 minions of a 20 person group really thought they were going to accomplish. Did they think they were going to defeat you? Sometimes, however, this illusion was shattered when a guard would show up late and see 40 bodies strewn about the square and still challenge you. The AI had to see act of killing to get scared, and did not register the quantity of corpses at your feet, only that you had killed someone and needed arresting. 2. Ending — I’ll keep this one brief. A lot of the hype surrounding this game was around its twist that is revealed in the first 5 minutes of play. It is a pretty big twist, but anyone watching previews/reviews already has had it spoiled. What no one has mentioned, is that twist is nothing compared to the twist at the end of the game. While Altair’s story has a decent sense of conclusion, there are far more questions than answers, a large twist, and obvious setup for a sequel. I hate cliffhanger endings, but this one was done as well as they can be.